Posted in Misc and tagged Airbrush, Frances Fitzgerald, photoshop at 11:49 am on January 31, 2019 by Bodger. 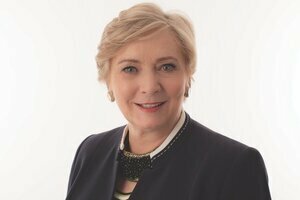 She had to resign because she misrepresented the extent of her knowledge about what went on in 2015, she was slow in answering legitimate questions, her briefing to the Taoiseach saw him mislead the Dáil, and her Department failed to discover important documents to the disclosures tribunal. 2. The reason she resigned was because of what happened in 2017. Deputy Fitzgerald resigned last November because the Dáil was misled about her knowledge of issues at the O’Higgins commission that took place in May 2015. I repeat that this is an issue of political, rather than legal, accountability, best assessed by the Members of this House. At 68 years of age I wish she just retired . Hugely disappointed in her term in Justice. Beauty-face turned up to 12. That trick of opening the eyes extra wide to create the impression of alertness can result in a rabbit-in-the-headlights look. I’m assuming you mean for TD? or Minister? why would you set a 10-year limit?